The outdoor aspects of a property are often under-utilized and overlooked by property owners and managers. However, they hold the potential to become highly valued spaces for property users. When designing commercial landscapes, there are many elements to consider, such as aesthetics and comfort. Of course, working with a professional landscape architect is always the best solution for maximizing your outdoor space, but here are some ideas to get your creativity flowing as you start to conceptualize your new amenities. What is the purpose of the space? Will property visitors actively use the space or is it mostly an aesthetic upgrade? What are the privacy goals? Are you looking to create a public space or a more private one? What challenges does the space pose? How much maintenance can you take on? Once you’ve answered the basic questions about the space, you are ready to start getting creative with your solutions. Purpose – When designing commercial landscapes, there’s a big difference between aesthetic upgrades versus functional spaces. Aesthetic upgrades might include planters or gardens to soften the entryway to the structure, plants to add pops of color, or commercial awnings to help draw more business. Creating functional spaces means thinking about seating, walking paths, and shade. Privacy – Designing public spaces are a great way to invite more people onto the property, but private areas may be ideal for incorporating new amenities for those who lease space in the building. Consider how you’ll need to define the space. Hedges and trees are a great way of sectioning off areas of the property to create an oasis. Challenges – From sloping grades to irrigation to intense sun, designing commercial landscapes requires you to be realistic about your property’s challenges. After all, you don’t want to invest in upgrades that can’t be sustained. For example, both aesthetic and functional upgrades need to consider sun exposure. Plant life should be chosen strategically for the space in which it will be planted, and patios should offer shade solutions for guests. Here are some Creative Ways to Maximize Your Commercial Property’s Outdoor Space. 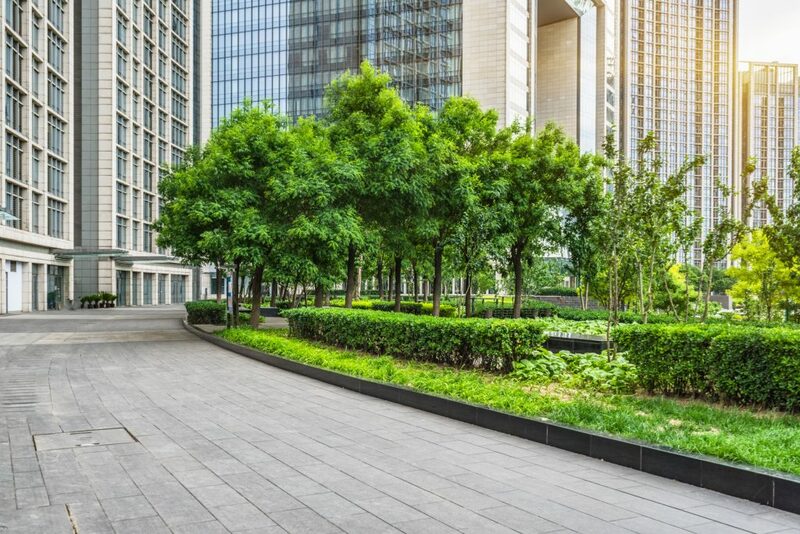 Maintenance – Whether you’re thinking about sustaining new landscapes or keeping outdoor furniture looking great, it’s important to design commercial landscapes with maintenance in mind. For example, a motorized commercial canopy can be designed with sensors that automatically retract it when wind or rain becomes an issue, so you don’t have to worry about assigning the task to your maintenance crew. A professional commercial awning company can help you choose the option that’s best for your property. Are Retractable Awnings and Canopies Right for Your Commercial Property?